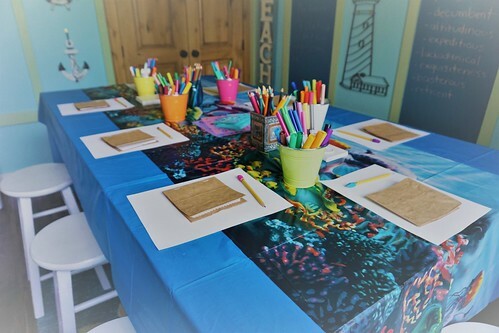 This month I’ve been holding weekly two hour craft sessions in my beach themed crafting room with several neighbor girls. I hold a morning session and an afternoon session because I have as many as 14 girls showing up to craft and my table comfortably seats 10. This was my favorite journal cover. 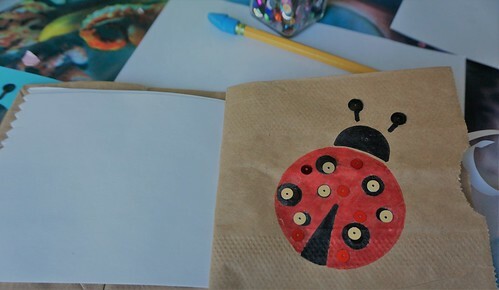 There are only four main supplies needed for paper sack journals: lunch sacks, blank paper (such as copy paper), something to bind the two together (we’ll get to that in a minute), and coloring tools, such as markers, colored pencils, and/or crayons. 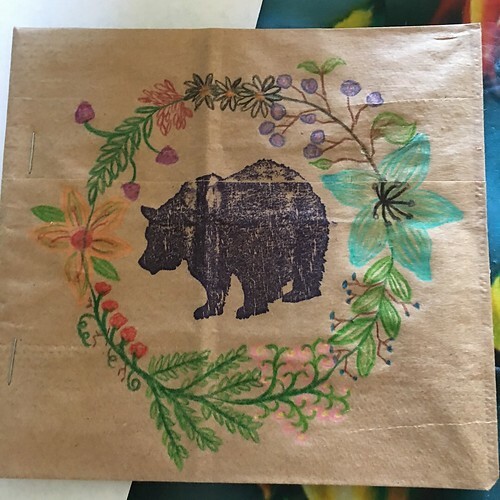 I also supplied a few nature-themed stamps I had on hand, black ink pads, some nature-themed stencils, and washi tape (some of the girls used washi tape to cover the staples and give a book a bound look). I did not take pictures of the assembly, which my daughter and I did beforehand (to save time). 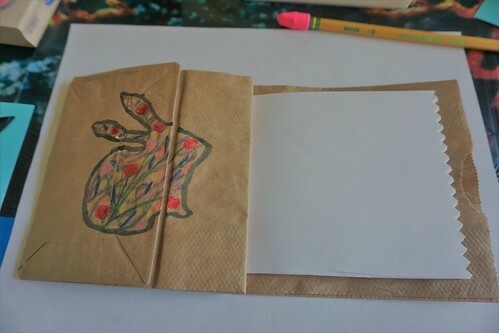 For each journal we simply folded a lunch sack in half. That made the cover. We then folded two 8.5 x 11″ sheets of paper in half length-wise, and then into fourths. We cut along the longest folds, leaving the short folds in-tack. That gave each journal eight blank pages. We cut the edges with scallop scissors, centered them inside the sack and then stapled it together. Another option for binding would be using a hole punch and then threading ribbon or yarn through it. By the way, eight pages, with one paper sack, proved to be just enough for our stapler to handle. Here’s an example with the washi tape. 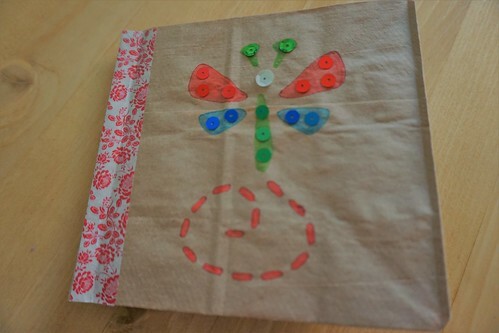 The dragon fly was made with a stencil, water color pencils and sequins. 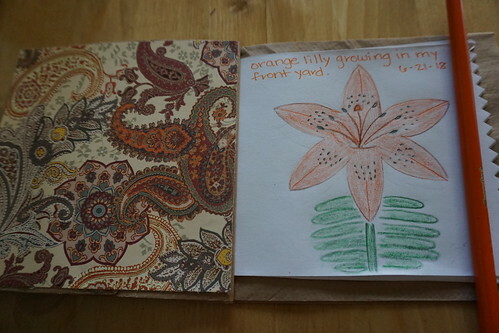 After the girls decorated their journal covers, inside and out, I sent them outside for a nature hunt. We made up our own nature hunt and chose descriptive words such as soft, hard, smooth, bumpy, fast, slow, high, low, red, exquisite, etc. The girls found items to fit each category and some wrote them in their journals, while others chose one item to observe and sketch. We then discussed some of the items they found. I suggested that the girls write the date on their journal page. My kids love these kinds of arts and crafts! Sometimes the simple arts and crafts are the best kind. What a great party favor and what a fun and creative party theme! I thought more of the girls in my craft group would use the washi tape. It seemed the younger girls used it more than the older girls. The girls in my group get pretty creative. I love the cover designs they came up with as well. Thanks for your comment! These are so cute and simple! I like the bird cover. 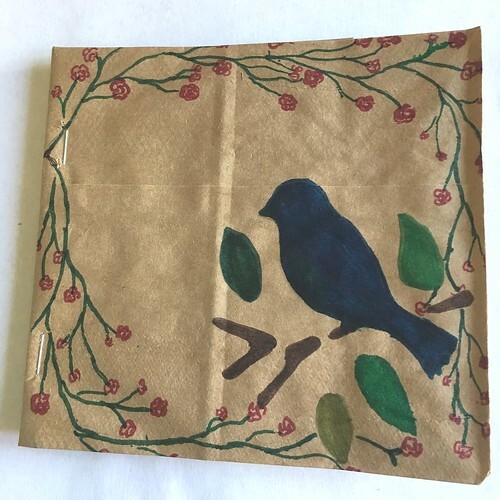 We made journals out of 4 sacks folded and stapled together, which made it so that we could slip treasured items into the bag openings as well as writing directly on the bags as our paper. It’s not as clean as the white paper, but it is fun to have loose parts added to the book. I did forget to mention that there is an automatic pocket so I’m glad you brought that up. Stapling more together and just writing on the sacks sounds great to me. Thank you for the compliment, Anne. This is a fun idea! My two girls would love making these! Those look great! So creative.